The signing of Preston North End’s young startlet Connor Simpson is a massive coup for Lancaster City. That is according to manager Phil Brown who was delighted to snap up the 18-year-old striker on loan last Friday. The 6ft 5in forward joined PNE earlier this season from Hartlepool United and made his Championship debut in 2-2 draw away at Aston Villa last month. North End boss Alex Neil was keen to see Simpson gain some vital experience of men’s football to continue his development and was only too happy to lend him to the Dolly Blues. Simpson follows in the footsteps of Josh Earl who spent time on loan with Phil Brown’s side before breaking into the PNE first team this season. 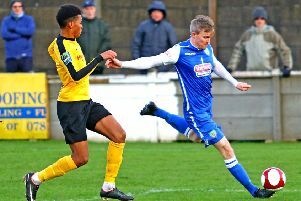 “Connor’s a Championship player isn’t he,” said Brown, who was hoping to hand the new boy his first-team debut on Saturday only to see their NPL Premier Division fixture at Barwell postponed. “He’s a professional footballer for Preston North End and we’re a Northern Premier League Premier Division team, so it is quite a coup. “He has played at National League level with Hartlepool so he does have some experience at this level. “We made an enquiry to see if he could come in on loan because we have a few injuries, but we were also looking to get in another attacking option. “Preston wanted it and thought it was a good opportunity. “He can play with us and train with them – and he did train with us on Tuesday night. They can still nurture him and develop him because they will be seeing him every day. “But he can get some game time with us at decent standard against adults. Being such a tall, rangy attacker, Brown is looking forward to utilising his various strengths. “We have been working on a few things in training,”Brown added.”We have had a couple of sessions with us. “I have no doubt that he will secure the ball better for us in attacking areas; a little bit better than what we have been doing. “He’s a big lad, has got a good touch. He will bring others into the game, which is what we have been missing. Having been thwarted from playing his first game for the Dolly Blues last weekend, Simpson is set to start on Saturday when Stafford Rangers visit Giant Axe. The two teams only played against each other a couple of weeks ago and it was certainly a dramatic affair as City snatched a point with two injury-time goals to draw 2-2. “They will be disappointed to have conceded two late goals, but my take on it was we deserved to score those goals over the course of the 90 minutes – we created so many chances,” Brown said. “We were well worth the two goals, it was just a bizarre set of circumstances that we got them in injury time, but that’s football for you. “They are on a good run at the moment – I think they are unbeaten in their last five games. This weekend Rob Henry and Adam Sumner are unavailable due to other commitments, while Tom Kilifin is out due to the open wound he suffered in his leg during City’s last outing at Marine. Steve Williams and Paul Jarvis will be assessed at training tonight after they were also injured against Marine. Meanwhile, Brown is quietly confident that his men can upset the odds on Wednesday night when they face Chorley in the LFA Challenge Trophy semi-final at the County Ground. The two teams met in the final of the competition at Bolton Wanderer’s Macron Stadium two years ago, with the Magpies prevailing on penalties. “We renew rivalries with Chorley,” Brown said. “We played them a couple of years ago and it was a great game. “We acquitted ourselves very well that night.